Happy Birthday Ella Isadora Bushman Barker! Ella Isadora Bushman was born February 3, 1884 in Lehi, Utah to Jacob and Charlotte Turley Bushman. She was their tenth and last child. Her father told her she was the tithing child and would have to be given to the bishop, and this really worried her. She married Rufus Orrin Barker on Oct. 23, 1901. To this union was born seven children. When three months old, Ella moved with her mother and father, brother and sisters to Arizona where they had been called to help settle St. Johns. After six years they returned to Utah where they settled in Fairview, where Ella’s sister, Sarah Erminnie’s husband helped him to get started in farming. 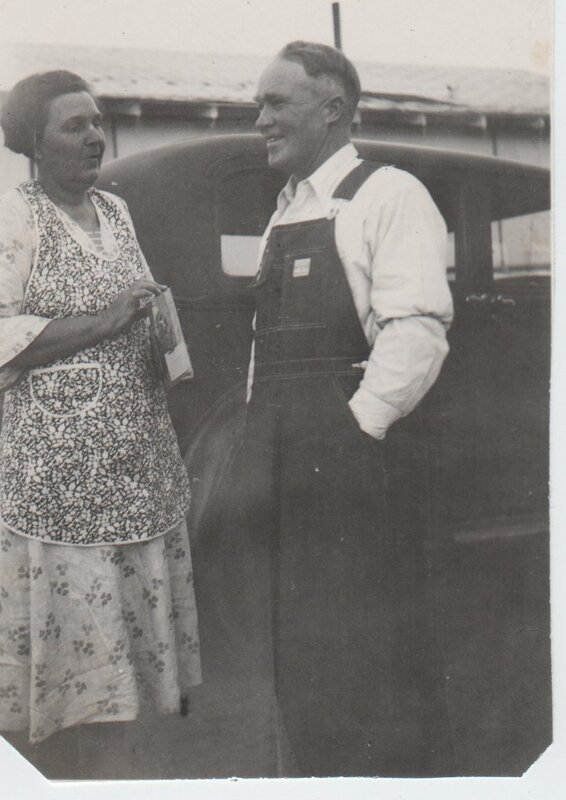 When Ella was eight years old her parents, brother Jacob, and sister Ida, moved to a farm which is now known as the Barker farm and has been in the family for 81 years. From this farm Ella walked 2 ½ miles to school, which she loved very much–being a very bright, active, and fun-loving child and graduating from her class as valedictorian in the spring. Ella was blond and blue-eyed. Her mother, Charlotte, was black-haired and black-eyed. Her school friends told her that Charlotte wasn’t her real mother. Grandma Charlotte assured her little girl that she was truly her mother. The following November after Ella graduated her mother died after a short illness. It was her first great sorrow. That winter Ella went to Salt Lake City to be with her sister, Grace Honor Lundquist and her husband Emanuel, who ran a grocery store in front of their home. 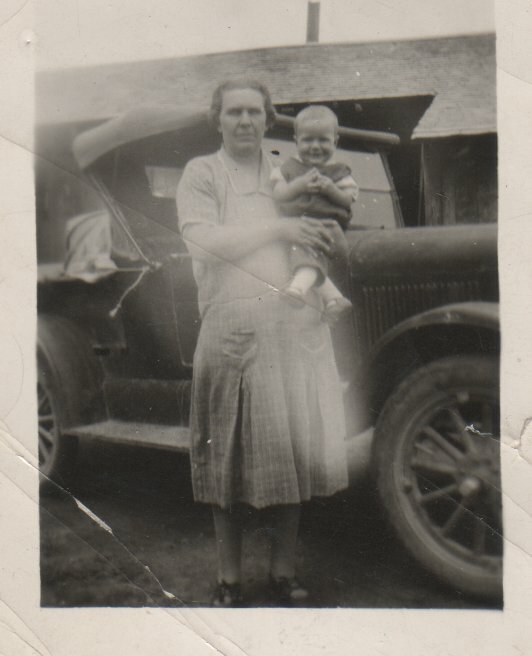 Ella helped in the store and was able to assist her sister who had a new baby [my grandmother, Ruby]. Ella missed her mother and father very much. When she returned home the following spring she found out that her very best friend, Maggie Anderson, had died. Ella went to live with her sister Sarah, whose husband had died a year earlier, and her two children, Jim and Ruby. Mother started teaching in Sunday School when she was 14 years old, and has been active in Church all her life being YWMIA president for 5 years, Gleaner teacher many years, Relief Society class leader, and Sunday School teacher. When Ella was not quite 18 she married Rufus Orrin Barker. Their first baby, Basil Orrin, was born 14 months later. When he was six weeks old Ella contracted Lobar pneumonia and was ill many weeks, some of the time in a semi-conscious condition. Someone was constantly by her bedside. The night the fever broke, Ella went through a crisis. Dr. Ray sat by her side all night. He was not a Mormon and when the Elders administered to Ella he would step out of the room. He was a wonderful man, though. The morning after the crisis Ella was alone in the room for a few minutes. Her fever was gone and she was very cold. She tried to get the covers up on her shoulders but was too weak. Suddenly the covers were tucked around her and she saw her mother, Charlotte standing there. Ella was very impressed by her mother to have faith and have the Elders often. Then Charlotte just faded away. When the nurse came in she asked Ella who had covered her, but Ella asked her to send her husband Orrin and father Jacob in. She told them what had happened. From then on they had the Elders every night while she was in bed for two months. One time when Ella was 37 years old we nearly lost her but she was permitted to stay and raise her family. She died Sept. 4, 1956 at the age of 72. Her children remember her as a wonderful mother with a great sense of humor. That and her great faith carried her through many trying times. She was a widow for 15 years, having lost both her husband and a little boy, Welles, when he was 11 ½ years old. Mother Ella’s patriarchal blessing said she would be a “peace-maker” which she surely was. Even when her health was very poor the last six years of her life many people would drop into her home to visit with her and confide their problems to her. She never violated a confidence and was usually able to lift the spirits of those who called. My mother had a proud, dignified bearing with a sparkling personality. I have never seen her without her hair combed and a neat clean dress. She was a kind, sweet mother and a loving wife. Our parents truly set an example for us. 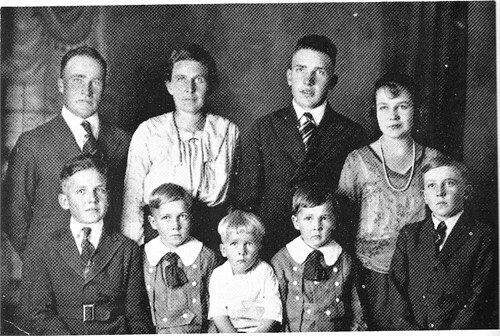 Mother had many hobbies and talents: knitting her own children’s stockings, mittens, caps, and crocheting dozens of sweaters, booties, and caps for her grandchildren and great-grandchildren, besides many beautiful crocheted doilies and other handiwork. I must finish this by saying mother was afraid of only one thing–a mouse. In her later years mother wrote her autobiography and had it printed in a lovely little book, to give to her six living children. From this, I gathered the material for her history.